my world was forever changed by the movie matilda. i love that movie for so many reasons (and yes, i read the book first and was fully obsessed with everything roald dahl), but the breakfast scene really takes the pancake for me and is forever engrained in my mind. that tiny lady making the fluffiest pancakes all by herself - those sunny kitchen vibes - and that song by rusted root - it all just makes me SO happy. i always aspire to make pancakes as fluffy as matilda's. this recipe is based on my great grandpa's classic pancakes, but i amped it up a little to make 'em extra fluffy & puffy so i can be more like my girl 'tildy. the chunky blueberry sauce is inspired by the most delicious pancakes in the whole world that you can find at bubby's in new york city. the james beard pancakes with blueberry! so thick and fluffy and delicious and the warm blueberry sauce is perfect. i mean, if yer gunna spend $21+ on pancakes, better make em damn gooooooood. apparently i am quite impressionable when it comes to pancake lifestyles. lol. thanks matilda & bubby for the excellent collab of pancake inspiration thangz. Heat a skillet, pan or griddle on medium/high heat. Add a thin pat of butter to grease the pan or spray with cooking spray. In a medium bowl, combine the dry ingredients for the pancake batter. Add the milk. In a separate, small bowl, separate the egg white into the small bowl and drop the egg yolk into the dry ingredients + milk and stir until combined. Whisk the egg white until firm and fluffy (a few minutes). I use an old tymey manual egg beater. Gently fold the fluffy egg whites into the pancake batter until incorporated. Keep the pan or skillet at a steady medium heat when cooking the pancakes. Use a 1/4 cup measuring cup or a large spoon to scoop pancake batter onto the pan in 3-4 inch circles. I usually do 4 pancakes at a time or however many will fit on the pan with room to cook without running into each other. To make the blueberry sauce: Add coconut oil to a small sauce pan to melt on medium/low heat. Add the fresh blueberries and brown sugar and mash gently (I use a potato masher but you can use whatever works to burst some of the berries). Let warm and simmer for about 5 minutes. Serve warm! Also check out my baguette french toast recipe with fresh blackberry sauce if this sort of stuff tickles your fancy! excited to share this one! pete & i love to make gyros at home - and we've made them in several different ways using ALL items you can buy at trader joe's! all for $22! and you can use these ingredients to make either a whole bunch of gyros at once, or stretch them out to have them in 2-4 sittings, depending how many people are eating and how many gyros you'll have. i usually eat 1 if we're using the naan bread; if we're using the thinner flatbreads i might have 2. anyhoo you can stretch these out and have gyros for several meals! and you can have this done in less than 20 minutes! very excite! i LUHUHUHHHHVE gyros. & greek food in general. even though these are considered the hot dog of greek food, me no give a hoot. i proudly enjoy hot dogs too, so there. so the meat component in here is meatballs -- not lamb + beef. but, i find that the italian meatballs at TJ's do a great job at mimicking gyro meat flavor. especially when you crispify them. italian style meatballs ($3.99), tomatoes ($2.29), cucumbers ($1.99), green bell pepper ($0.69), spinach ($1.99), red onion ($0.89), feta cheese ($2.69), tzatziki ($3.49), and naan ($3.69) or flatbreads. you can use other colors of bell peppers or other veggies you like, these are just the basics of what i normally go for, flavor-wise. it doesn't matter what type of tomatoes or cucumbers you get - they have a few varieties. also, i prefer to make tzatziki homemade. but they've got it at TJ's, too! the naan bread is super fluffy and has a great texture, but they're an odd shape to fit stuff in. i'll get the middle eastern flatbreads at TJ's most of the time. pitas work, too. i've tried using TJ's turkey meatballs in these gyros, but the regular italian style are just way better tasting. way mo fat & calz though. i actually barely use two meatballs on my gyro because i'll slice them up and crisp up the interior in the pan. and they're pretty rich. one meatball goes a long way for me. pete just goes whole meatball style; he doesn't know what calz are. dice up the tomatoes, cucumbers, green pepper, some red onion, add a few shakes of salt & pepper, and gently toss with a spoon. i like to chill this while i'm waiting for the meatballs to cook. we kicked our microwave to tha curb, so i like to thaw the meatballs a little bit before putting them in the pan. i add a little water and cover the pan to steam it up for about 5 minutes, then uncover and turn them to crisp. then i'll cut them in half or slice each meatball into 4 and crisp up those innards on low while i'm getting everything else ready. if you do have a microwave, heat them in there for a few minutes and then brown them in a pan for about 5 minutes. 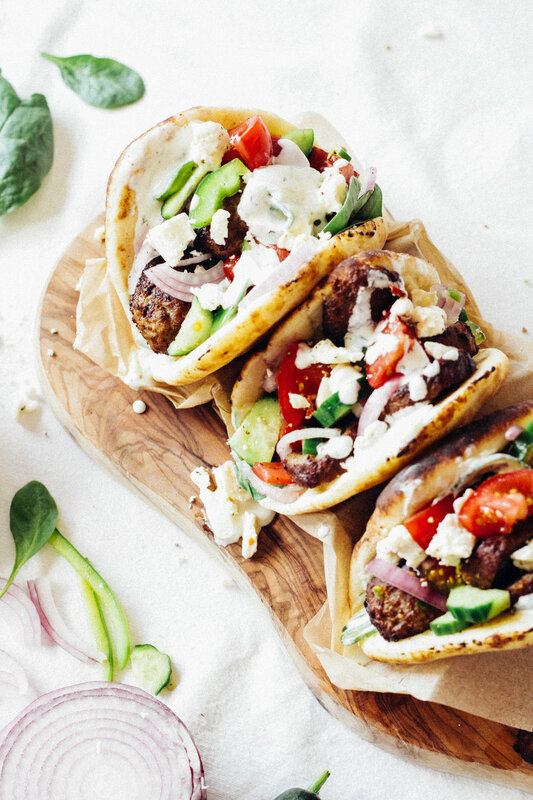 warm the naan, flatbreads, or pitas on a pan til they're easy to fold, then build your gyro! i like to bulk it up and add extra greens like spinach, then layers of tzatziki, veggies, meatball slices, feta, and more veggies on top! sriracha is also amazing on gyros. hey! you could also use the extra veggies & such to make a chunky greek salad on the side! we love you TJ's! and obviously while you're there you'll probably get a cheap bottle of wine and some sort of delish seasonal cookies or fabulous chocolate treat. because that's just what happens in that place.